An expert in ancient Egyptian art, Elizabeth Titzel was born in Pennsylvania but grew up in Chicago where her father was a physician for 55 years. She earned an A.B. in Classics from the University of Chicago and taught English composition there for a year, but abandoned teaching for a career in journalism. She joined the editorial staff of Asia: The American Magazine on the Orient and in 1922 went to the Near East (at 33 and single) traveling in Jordan and Palestine, interviewing Bedouins and businessmen, soldiers and Emirs. After her return to the States, she met her future husband, Rudolf A. Meyer Riefstahl who had his doctorate in art history and was an expert on Islamic Art. In 1924 he joined the faculty of New York University's new Institute of Fine Arts and married Elizabeth. They had a daughter and son and the son was born in Turkey during one of the couple's many sojourns abroad. Between 1924 and 1936 the family visited and lived in many Middle Eastern countries and also lived for a time in Rome. 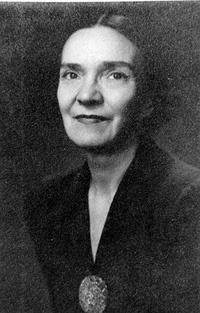 Elizabeth collaborated on many of her husband's numerous publications until his death in 1936. Now a widow, Elizabeth Riefstahl needed a paying job and coincidentally the newly established Wilbour Library of Egyptology at the Brooklyn Museum needed a librarian with experience in the field. She succeeded in improving and cataloguing the collection of what became an outstanding library for the scholarly world. She also devoted herself to publishing objects in the Museum's collections and became the Associate Editor of the Brooklyn Museum Quarterly. When World War II broke out and took male curators away from the museum, Mrs. Riefstahl took over the practical running of the Department of Ancient Art. When objects were brought back from evacuation, she was in charge of their reinstallation. She wrote, edited and supervised the production of several books and articles and was in great demand as a lecturer. After the war she was appointed Assistant Curator. In 1953, Riefstahl visited Egypt while Dr. John Cooney the Curator was serving in Cairo as Director of the American Research Center in Egypt on a Fulbright Fellowship. That year she also spent two months in Hollywood as a technical advisor for the film, The Egyptian. Elizabeth Riefstahl retired in 1956, but edited the museum's Quarterly for another year. She then moved to Massachusetts to be near her daughter, but also to become Executive Secretary of The American Research Center in Egypt, which was then based in Boston. She was editor of the organization's Newsletter until 1969. In her eighties, she was brought back to the Brooklyn Museum by its new curator of ancient art, Bernard V. Bothmer to edit every publication produced by the Department. She worked on the exhibition catalogues for the Akhenaten and Nefertiti show (19973) and on that for Africa in Antiquity (1979). After her second retirement she continued to write and left, at her death, two unfinished manuscripts. Keywords: Walter Randolph Titzel, Maryland College for Women, University of Chicago, Chicago Daily News, Asia: The American Magazine on the Orient, Jordan, Palestine, Rudolf A. Meyer Riefstahl, Institute of Fine Arts, New York University, Turkey, Egypt, Syria, Italy, Anatolia, Robert College, American Women's College in Constantinople, Turkish architecture, Brooklyn Museum, Wilbour Library of Egyptology, Charles Edwin Wilbour, Brooklyn Museum Quarterly, John D. Cooney, American Research Center in Egypt, Hollywood, Bernard V. Bothmer, William C. Hayes, Cyril Aldred, Henry Abbott, New York Historical Society.